While Google is getting ready for the Pixel 3 and Pixel 3 XL launch event set for this week, fresh details have been spotted in a flurry of new leaks. The latest set of reports of the upcoming Pixel duo, reiterates most of the information that has been leaked before. A listing of the Made by Google smartphones was spotted on a Canadian carrier, showcasing the smartphone's 'Not Pink' colour model. Meanwhile, more details about the price specifications come from a leaked UK carrier's brochure. Separately, a Hong Kong-based website's review has outed more information about the handsets. Additionally, more images of the Google Pixel 3 installed apps, retail box, instruction booklets, settings menus, and more have been leaked. Notably, the Google Pixel 3 and Pixel 3 XL will launch at Google's annual Made by Google event on October 9 in New York City. As per a 9to5Google report, a Canadian carrier Freedom Mobile had listed the alleged Google Pixel 3 and Pixel 3 XL) in a 'Not Pink' colour and 64GB inbuilt storage option. While the listing showed a 128GB inbuilt storage variant of the Pixel 3 lineup, but the new colour option seems limited to the lower storage model. Additionally, the listing showcased renders of the two handsets and they are in line with most of the previous leaks. It is expected that the rumoured 'Pink Sand' colour model will be called 'Not Pink'. It is worth noting that the carrier has now removed the listing from its website. Coming to the specifications, the listing showed that the Pixel 3 and Pixel 3 XL run Android 9 - that's no surprise, as the Pixel devices are the platform lead devices for Android. They are said powered by the Qualcomm Snapdragon 845 SoC, 4GB of RAM, and come with an IP68 rating for water and dust resistance. The Pixel 3 XL sports a 6.3-inch (1440x2880 pixels) display. It will be fuelled by a 3,430mAh battery. In terms of dimensions, the phone measures 157.9x76.7x7.9mm and weighs 184 grams. In terms of pricing, the carrier listing put the cost of the 64GB model at CAD 1,129 (roughly Rs. 64,300), while the 128GB model showed a CAD 1,259 (roughly Rs. 71,700) price tag. The Pixel 3, meanwhile, comes with a 5.5-inch (1080x2160 pixels) display. Interestingly, the listing showed a 3,915mAh battery. It measures 145.6x68.2x7.9mm and weighs 148 grams. The listing showed the price of the 64GB variant as CAD 999 (roughly Rs. 56,900) and CAD 1,129 (roughly Rs. 64,300) for the 128GB model. Meanwhile, a listing from a retailer's magazine has showcased the alleged Google Pixel 3's 'Top Shot' camera feature, apart from hinting at a Google Home Hub launch date. FrontPageTech's Jon Prosser posted a few images from a UK carrier magazine on Twitter, hinting at some more features of the handsets. The images showcase the White colour models of the Pixel 3 and Pixel 3 XL and the display notch on the latter. The alleged UK prices of both the handsets have also been detailed in the images. 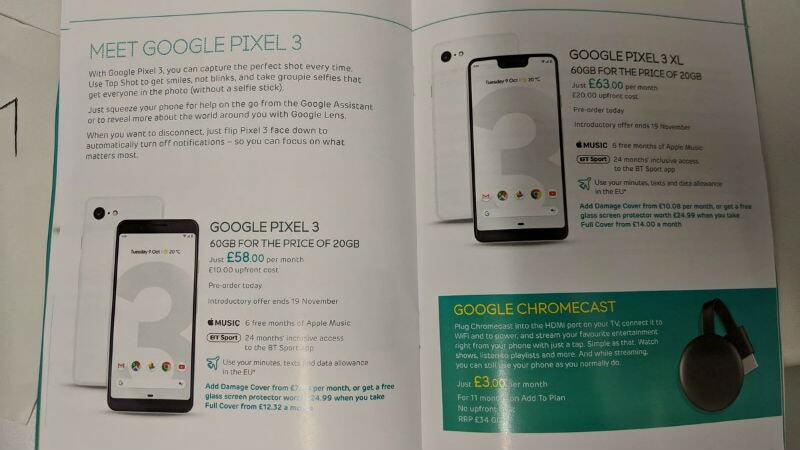 The Pixel 3 price is shown as GBP 58 (roughly Rs. 5,600) per month with GBP 10 (roughly Rs. 1,000) upfront cost and the Pixel 3 XL is listed at GBP 63 (roughly Rs. 6,100) per month with GBP 20 (roughly Rs. 2,000) upfront cost. As mentioned, the advertisement hints at the company's camera strategy on this lineup. The Pixel 3's 'Top Shot' is claimed to be able to 'capture the perfect shot every time'. However, there are no details available on this feature. Notably, the ad also mentions a 'groupie selfies' feature. The previous leak also provides a possible launch date for the Google Home Hub. As per the ad, the Home Hub will get launched on October 22. Interestingly, a store in Hong Kong called WahPhone Digital has reportedly been selling the Pixel 3 XL priced at HKD 15,880 (roughly Rs. 1,49,800). Folks at Engadget got hold of one of the units for an early hands-on. As per the images shared in the report, buyers will get USB Type-C earbuds, a headphone jack adapter, a Type-C cable, and an 18W power adapter inside the box. Unfortunately, the box did not reveal the exact specifications of the smartphone. However, there is a mention of a 6.3-inch display, 128GB inbuilt storage, 'Just Black' colour model, and G013C model number. The Pixel 3 XL unit is said to include a Snapdragon 845 SoC, 4GB RAM, a 12.2-megapixel rear camera and two 8-megapixel front cameras, a display with 1440x2960 pixels resolution, and Android 9 Pie. Meanwhile, an early review of the Pixel 3 XL has been spotted on Hong Kong-based site Unwire, hint at some of the features of the two handsets. While the specifications listed in the review are a reiteration of previous leaks, it also comes with a set of camera samples. It shows two low-light sample shots taken with the Pixel 3 XL and iPhone XS Max put side-by-side. Apart from this, the review also comes with several images of the two smartphones. Another report on the same website also corroborated the Engadget report that said that the Pixel 3 XL is being sold in the Hong Kong market. 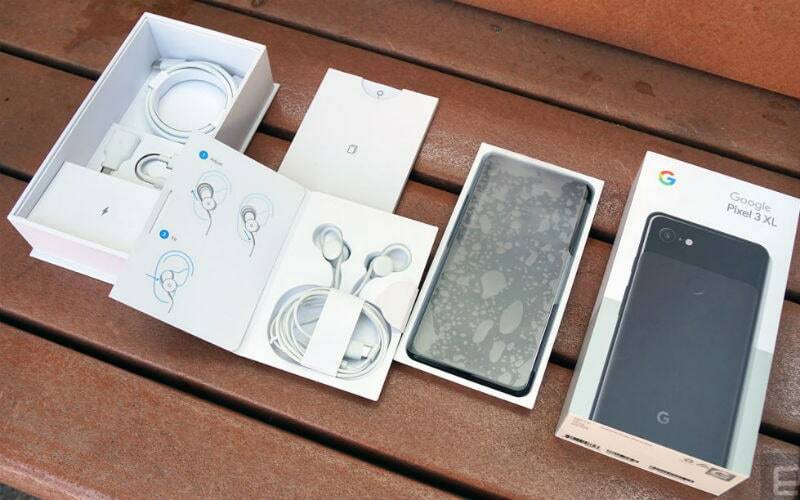 A 9to5Google report has yet again posted more images of the retail box of the Google Pixel 3 XL. The report also posted images of the instruction booklets and the Settings menu. An 'adaptive' colour option can also be seen. Meanwhile, there is a blue pop up for what is expected to be Pixel Tips. The report also posted images showcasing the full list of installed apps, that includes a standalone APK for the Pixel Stands, a Pixel Tips app, and a Pixel Visual Core Service app. Finally, two Twitter users have also shared a number of images of the Pixel 3 XL. Galaxy S10+ vs iPhone XS vs Pixel 3 XL vs Huawei Mate 20 Pro: Does Samsung's New Flagship Have the Best Camera?